Become Death, the grim reaper, and dive through a mythological multiverse to reclaim Death’s stolen scythe. Precision control over jump angles gives you the power to make your own path through each afterlife. Rely on reflexes and rapid angle changes or approach levels as a puzzle of angles to be solved with foresight – choose your own path as you hunt for the scythe and recapture escaped souls. Whether it’s curiosity and exploration, risk-taking, or the speed of a psychedelic rollercoaster, each world is designed to emphasize a different gameplay theme. I recreated the experience I had gaming with college roommates, passing the controller around on different levels that matched each person’s individual style. Afterdeath’s 26-track soundtrack was composed to bring the personality of each world to life and to synchronize the player with the rhythm of each level. I hope you like it! 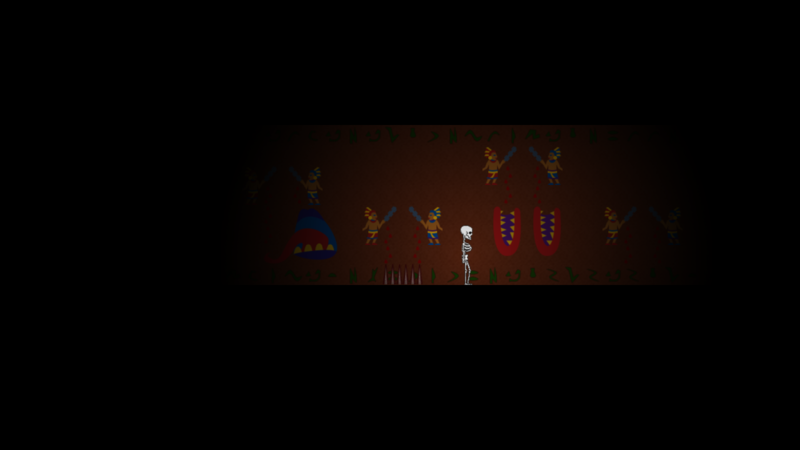 Become Death, the grim reaper, and dive through a mythological multiverse to reclaim Death’s stolen scythe. Chase the fleeing robot through the afterlifes of ancient cultures, each filled with restless souls who haven't forgotten who put them there. Sensing an opportune moment of weakness, Death's collection of souls of historical figures has escaped into the afterlifes too. 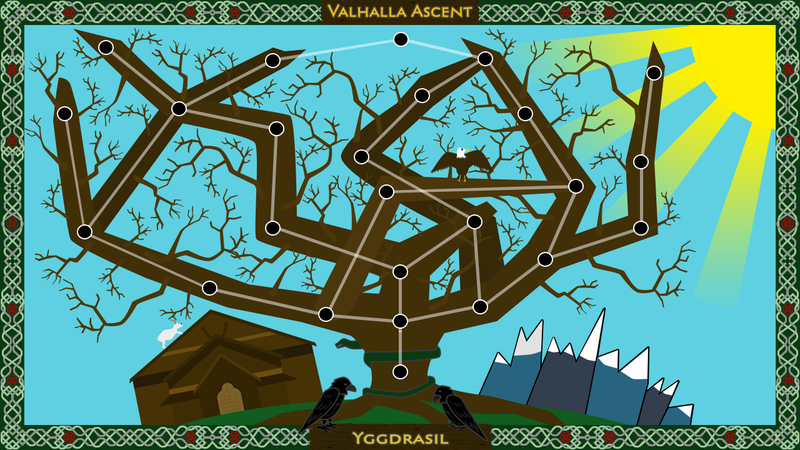 It's up to you to find and recapture them while pursuing the scythe from the depths of the Greek underworld to the branches of the world-tree Yggdrasil. Most platformers only let you move left or right and jump the same height with every press of the jump button. 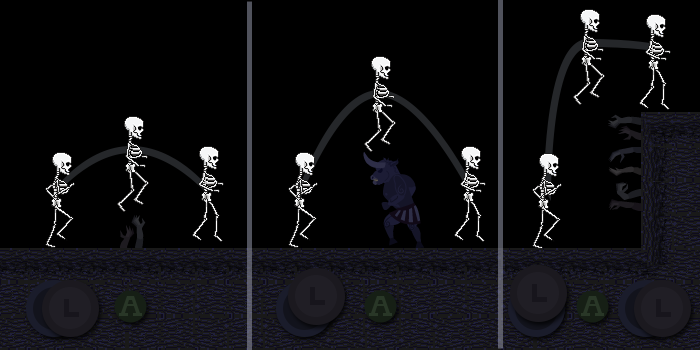 Unlike most platformers, Afterdeath lets you choose the angle of each jump with the thumbstick. Angle to the side for short hops that won’t slow you down when you’re outrunning minotaurs or rivers of lava. Angle farther up to leap over towering obstacles and the resentful dead. Precision control over jump angles gives you the power to make your own path through each afterlife. Rely on reflexes and rapid angle changes or approach levels as a puzzle of angles to be solved with foresight – choose your own path as you hunt for the scythe and recapture escaped souls. Combined with wall-jumping, sprinting, and aerial maneuvering, the jump mechanics give you the fluid control over Death that you’ll need to adapt to the ever-changing worlds of Afterdeath. That means more ways to beat every level and more challenging skill moves to prove yourself. Take the challenge further with the different movement mechanics of the unlockable characters. The All-Seeing Eye only moves by bouncing off floors, walls, and ceilings; doomed to follow each trajectory through the air. Dead Icarus can glide over great distances but is cursed to accelerate faster and faster into unknown danger. The Traveler may be slowed by a clunky environmental suit but it also allows for great jump distances after statically charging it by sliding down walls. Every culture creates its own afterlife and sustains it with stories and myths until it begins to take on a life of its own. 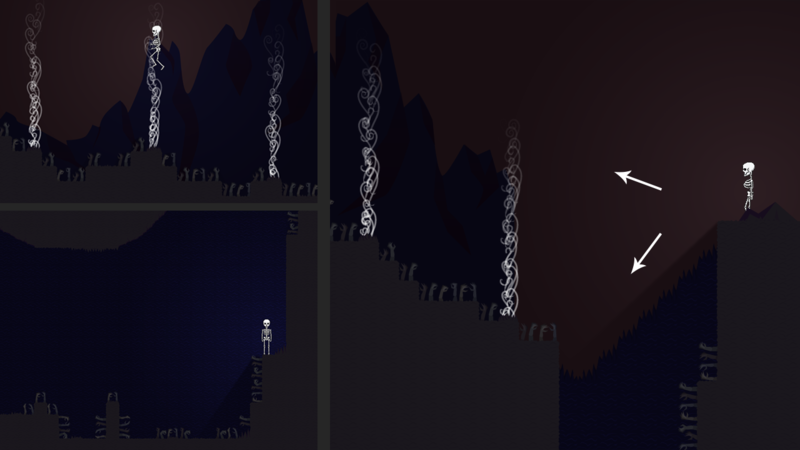 Afterdeath explores these afterlifes long after the cultures that created them have died. Meanwhile, the resident souls of those afterlifes have spent millenia trapped in their endless labors, building new empires of the dead. When the robot steals Death’s scythe, it sends ripples through the afterlifes, leaving Death powerless and vulnerable to the vengeful souls whose lives it’s taken. Journey from the caverns of the Greek underworld to the highest branches of the Norse world tree Yggdrasil to the uncertain depths of an Aztec maze. Whether it’s curiosity, risk-taking, or the speed of a psychedelic rollercoaster, each world is designed to emphasize a different gameplay theme. Cliffs of Despair, the world of Greek mythology, was designed with the theme of curiosity and exploration. The path through each level is not necessarily obvious and the obvious path may not be the only option. For example, in the Soul Pit level, there is a clearly presented path forward using the steam vents to buoy Death up into the air, coasting from each steam column to the next to cross the dangerous pit of souls. However, a curious mind (or someone conveniently missing their first jump) may discover a second path down into the pit of souls. 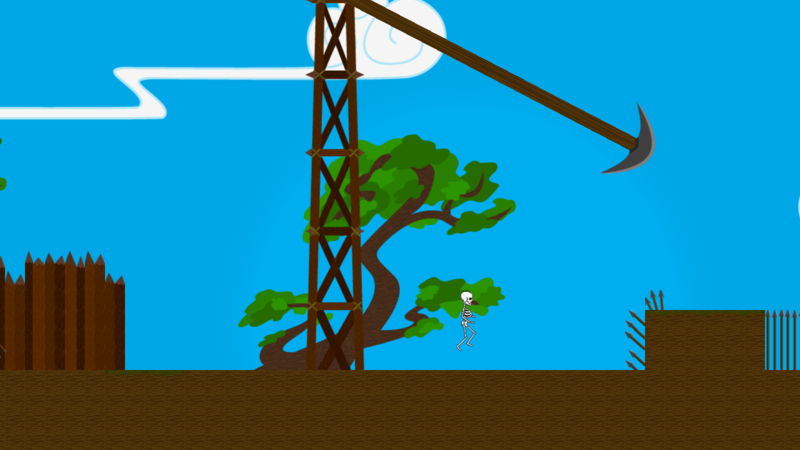 This level offers the player a choice of gameplay: take the upper path to learn the new skill of boosting from one steam column to another or take the low road to exercise mastery of familiar concepts, jumping at very specific angles to navigate the treacherous groupings of hazards. The jump mechanics of Afterdeath are so robust that there's room for many maneuvering choices in each level, including some unplanned ones that the players find on their own. Afterdeath’s 26-track soundtrack was composed to bring the personality of each world to life and to synchronize the player with the rhythm of each level. The music really shines in the Valhalla levels, where the theme of risk-taking involves a lot of moving hazards and split-second timing. Take cues from the music as you sprint toward the swinging blade of an onrushing pendulum, pausing briefly to dodge a barrage of arrows, then leap over a cluster of spears just before the pendulum swings back. Unlike the last world, these levels are linear and the path is obvious; it's the one through all the carefully-timed blades. If a drunken Viking can make it through this battleground training course, then surely so can you. Fortunately, this world map sports a number of tree branches that lead to the exit, allowing you to plot a course through the overworld that challenges your favorite skills while avoiding others. While one branch of the map will test your wall-jumping abilities, another might focus on rapid back-and-forth dodging ability. The only guarantee is that you'll be fully-trained for Ragnarok by the time you get to the top. The next world is the opposite of Valhalla in every way. The Demesne of Shadows is an unlit maze of passages, trapping you in the dark with limited visibility. There are many traps hidden in these hallways and, unlike Valhalla, they are actively trying to kill you. If you can manage your fear, you will notice that the murals covering every wall tell a story of the people who came to this land and the misfortune that befell them. You may even begin to realize that the patterns within the story contain clues to the nature of the traps hidden in each corridor and that understanding the story is the key to escaping the maze. I hope you're now as excited about this game as I am. You can find more information on the Afterdeath website and get regular updates by tracking our IndieDB page or following @Nonadecimal on Twitter. Of course, nothing compares to playing the game and seeing how the jumping mechanics let you take on each new challenge the different worlds can throw at you. You can download development builds and give feedback to help us transform Afterdeath into your new favorite game. Here is to hoping this wins a finalist slot for IGF! Thanks but it just wasn't in the cards. I'll try again next year when the game is complete and polished.